Combines general discussion, analytical mathematics, algorithmics, and actual working programs. That is, a cookbook on numerical computation. 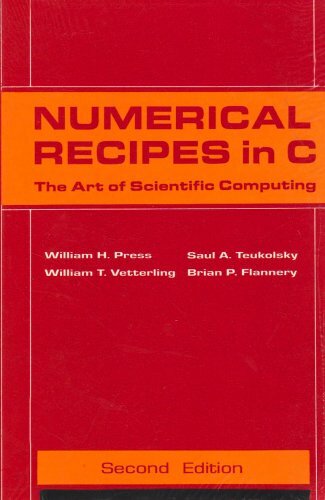 The aim in writing Numerical Recipes in C was to provide a book that combined general discussion, analytical mathematics, algorithmics, and actual working programs. Hence, a cookbook on numerical computation. This book is unique, in offering, for each topic considered, a certain amount of general discussion, a certain amount of analytical mathematics, a certain amount of discussion of algorithmics, and (most important) actual implementations of these ideas in the form of working computer routines. The final purpose in this book is thus to open up a large number of computational black boxes to your scrutiny. The book will teach you to take apart these black boxes and to put them back together again, modifying them to suit your specific needs. Although the C code seems to be rudely translated from Fortran, this book is a perfect reading for programmers who had forgotten much of the material from their math classes. :? "I had to endure reading this book for 2 long semesters, and I've come to know some parts of it pretty well. I'll try to be short and say that the book is an excellent reference for the practicioner (and for the poor student:) - however, the ill-placed "jokes" have terribly annoyed me and my fellow class mates." :) "In closing, this book is excellent for students wanting a good reference for quick and dirty types of analyses or scientific computing."